The copyright was finally issued for Wind Energy for the Rest of Us. A long time coming, the copyright was issued under Title 17 of the United States Code and became effective 5 December 2016. Copyrights are normally managed by the publisher. Since Wind Energy for the Rest of Us was self-published, the author is responsible for the copyright. With the advent of digital pirating, copyrights are more important than ever before. Authors can no longer assume that the mere act of publishing a work in the United States guarantees copyright protection. Those days are long gone. 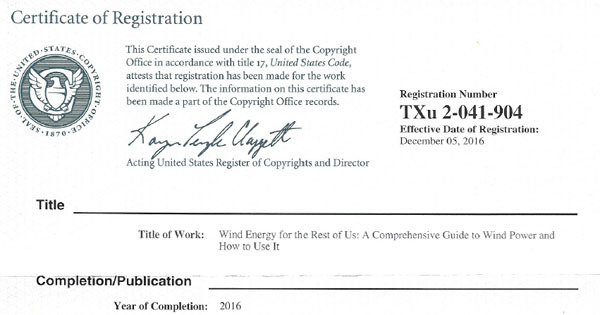 Wind Energy for the Rest of Us was issued copyright TXu 2-041-904. The Library of Congress has also issued Control Number 2016912305 for the work. Currently, the book is being heavily discounted by on-line booksellers. Amazon is selling the book for 35% off the list price. The book is ranked #9 by Amazon for books on wind energy.